I’m hearing a lot these days about ‘vertical storage’. “Use the wall! Use the wall!” they shriek on shows like Clean Sweep. 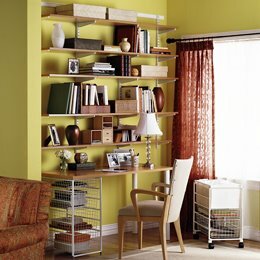 And then they cheerfully go on to build these gorgeous and elaborate storage systems that run right on up that sinfully wasted wall space, with little cubbies and boxes and whatnot to store all your stuff, vertically. You could fit the entire cargo of a fully-loaded Mayflower truck into a single 8x10 vertical space. Vertical storage is one of those idea which sounds really good on paper to me. I have a lot of stuff, and being able to run it up an otherwise ‘wasted’ wall has a certain appeal. Except for one tiny little detail: I’m 5’3” (when wearing shoes) (which I only do when it’s really cold, or I think I’m going somewhere soon). To me, this would mean I had two usable shelves, and three that would forever mock me with their inaccessibility. I could no more reach them than fly. Not even with a step stool could I reach them – the desk would mean I had to lean waaaaaaaay over to try to reach them. Even a ladder would be precarious at best. This is the problem I face with all vertical storage solutions. We have a huge big shelf out in the garage for storing our bulk purchases. The bottom four shelves are packed. The top two contain only those things my husband, Mr. 6’4”, has put away. And when I need something from Nosebleed Country, I have to wait until he’s around to get at them. Because when he’s gone, he’s usually taken the car, and the car roof is my Secret Weapon for getting to those upper shelves. The other thing that happens with things stored On High is that I can’t see things that may have been stuck on top of other things. Say, for example, that I have quite sensibly put a box of yarn on the top shelf in the office closet. And then let’s say that somebody…somebody tall…has come along behind me and maliciously put something else on top of the box. Let’s say, just for the sake of example, that they have put a lidded-but-not-fastened sewing box full of pins, needles, and several small spools of thread, on top of the box of yarn. I cannot see this smaller box on top of the bigger one. So I use whatever precarious method I deem necessary to get to where I can grab the bigger box, and I start to tip it down off the shelf, only to be confronted with the sight of the smaller box, invariably opening and raining its contents down upon my upturned face, hurtling down from its invisible perch. Which is my problem with these reality-based ‘home improvement’ shows: They leave out all the really valuable information, and discriminate against those of us who aren't tall enough to touch the bottom of a 7' shelf. Those spaces way up high are for the things you never use but can't let go of. I have a whole house full of those.